Otay Mesa, Calif. — Beginning Monday, May 2, U.S. Customs and Border Protection will open a new Ready Lane at the Otay Mesa port of entry for travelers who have a travel document enabled with Radio Frequency Identification, or RFID, technology. The Ready Lane is a lane for vehicle traffic that only accepts RFID-enabled cards. The new Ready Lane at the Otay Mesa border crossing will be open Monday through Friday from 4 a.m. until 8 p.m. and Saturday and Sunday from 8 a.m. to 10 p.m. In order to use this dedicated lane, all adult passengers in the vehicle over the age of 16 must present an approved travel card. The U.S. Passport Card, SENTRI card, the new Legal Permanent Resident “green card” and the new Border Crossing Card are all RFID-enabled documents. 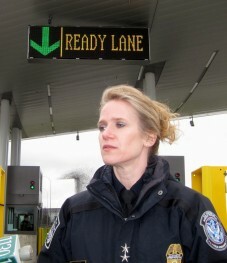 For example, the Ready Lane can be used by a group of travelers in one vehicle who may have different kinds of RFID-enabled travel documents, such as if the driver is a member of the SENTRI trusted traveler program, and the passengers all have other kinds of RFID-enabled documents, such as a U.S. Passport Card or a new Border Crossing Card. While only vehicles with all SENTRI members can use the dedicated SENTRI lane, a group with any mixture of RFID-enabled travel cards can use the Ready Lane. • Stop at the beginning of the lane and make sure each passenger has their card out. • When it is your turn, drive slowly through the lane and hold all cards up on the driver’s side of the vehicle. • Stop at the officer’s booth.